Sweet cantaloupe pairs beautifully with the sharpness of fresh blackberries. Combine with your favorite fiber-rich granola and protein-rich Greek yogurt for an easy make-ahead breakfast option! 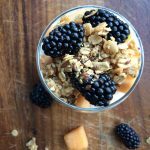 In a serving dish, layer Greek yogurt, cantaloupe, blackberries and granola. Repeat until serving dish is full. Top with any remaining fruit or granola. Really short on time? Consider buying your cantaloupe already cubed. For the granola, keep an eye out on the sugar and fiber content. Try to choose a granola with 3 or more grams of fiber and less than 8 grams of sugar per serving.